Eighteen months after announcing its probe of agency handling of President Trump’s controversial lease of a downtown federal building for his Washington luxury hotel, the inspector general of the General Services Administration on Wednesday released a tough critique of the process used to approve the unprecedented business arrangement. The IG’s review of the contracting process for handling the complex conflict-of-interest question that has prompted lawsuits and revisiting of the two-century-old foreign and domestic Emoluments Clauses of the Constitution found “serious shortcomings,” the redacted report said. Had the process been proper, the IG argued, GSA would have paid more attention to ethics advisories available through both the “binding” precedents cited by the Justice Department’s Office of Legal Counsel and the more general guidance laid out by the Office of Government Ethics. Investigators began by examining the internal GSA discussions shortly after Trump won the November 2016 election. 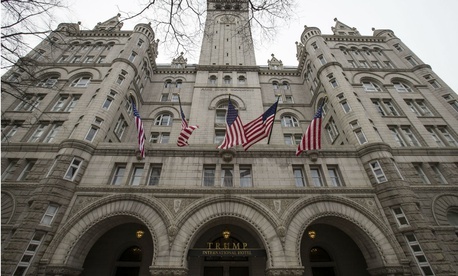 They spoke to the players involved in the March 2017 decision (before the confirmation of current GSA chief Emily Murphy) to allow Trump to maintain the lease as both, in effect, tenant and landlord—a possible violation of the Constitution’s prohibition on elected officials’ accepting gifts from foreign government officials who, in this modern case, may stay in the hotel. The GSA officials included GSA lease contracting officer, Kevin Terry; the GSA lease project manager, Brett Banks; GSA Deputy General Counsel Lennard Loewentritt; GSA Office of General Counsel attorneys Associate General Counsel for Real Property Barry Segal and Deputy Associate General Counsel for Real Property Timothy Tozer; former OGC Regional Counsel Paula DeMuth; and Public Buildings Service Deputy Commissioner Michael Gelber. To remedy the situation, the IG recommended that the GSA general counsel “revisit the issue of potential breach” at the Old Post Office federal property and reexamine the language related to the Emoluments Clauses in other GSA leases. Rep. Elijah Cummings, D-Md., the newly installed chairman of the House Oversight and Reform Committee who has long sought more detail on GSA’s handling of Trump’s Washington hotel lease, hailed the report as a “scathing” vindication of his criticism.